Well all good things must eventually come to an end, and sadly today the country of Canada found this out the hard way. 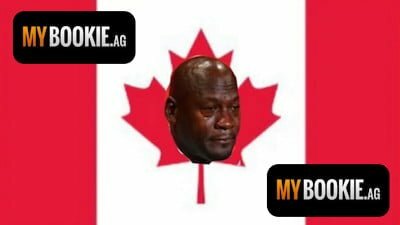 The immensely popular MyBookie Casino has announced that they will no longer accept Canadian players, only a few days before the popular gambling season begins with the kickoff of NFL football. The move comes as the company continues to restructure itself as it enjoys unprecedented growth around the world. Every player from British Columbia to Newfoundland can rest assured that their funds are safe and secure there, and they can simply log into their accounts and request a payout to any of their preferred methods for the entire balance. As always, anyone wanting confidential transactions should opt for Bitcoin as it’s absolutely untraceable and 100% secure. The MyBookie Sportsbook & Casino continues to be one of our top recommended operators for players in both the United States and Australia so you can play with them in confidence if you live in those regions. So where do Canadians go now to play casino games or bet sports online? Well, the best operator for 2018 so far has been BetOnline who have constantly offered their players huge bonuses and fun promotions. In addition to tons of Las Vegas table games and hundreds of slot machines, they also have a full sportsbook allowing players across Canada to gamble on NHL games, which is obviously the nation’s favourite sport. Anyone in the Great White North looking for a full suite of casino games in addition to a big sportsbook can also choose to open an account at Intertops, who are the oldest operator in all of North America. They were the first to accept bets online and they’re still going strong today. With over 20 years of experience you know that they can be trusted with your bankroll. Canadians who only want to play casino games online and don’t care about a sportsbook or racebook will probably want to visit Slots.lv as well because they pride themselves on offering more virtual slot machines than anyone else in the industry. They’re currently offering a massive $5,000 welcome package to all new players and that should definitely keep your balance full way into the new year.